I was quite lazy to fix my lunch today, I made a simple steam pork dish but for my muslim friends, you can also use minced beef. Granny taught me how to do this when I was 8 years old. She used soya sauce to marinate the pork, I used salt because my wife is allergic to soya. 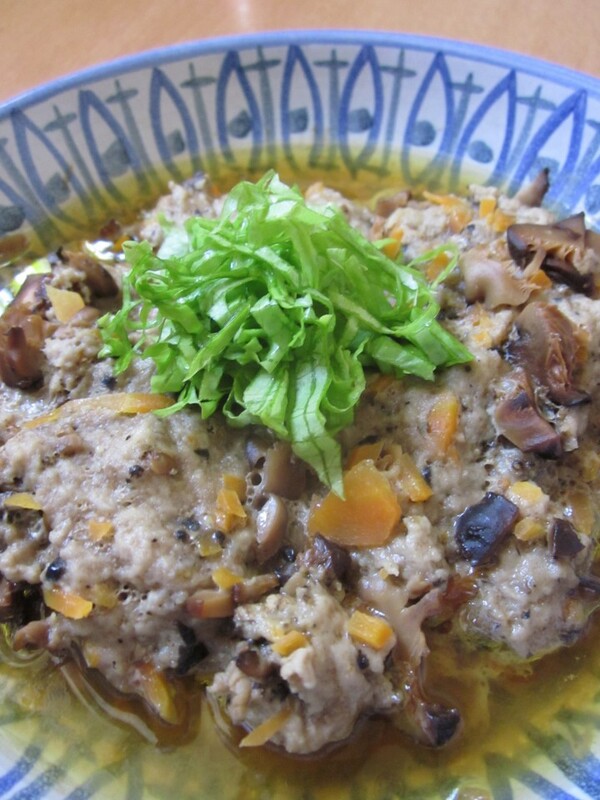 Soak shiitaki mushrooms for an hour in warm water. Trim off the stems of the shiitaki and button mushrooms. Chop all the vegetables roughly and mix all the ingredients together with the minced meat. Press the onto a deep plate and steam for 15 minutes. NOTE: You can use any cooking oil and a dash of sesame oil if you like. Sprinkle some chopped spring onion if you like. You can also add a few thin slices of good quality salted fish to give it another flavour. Isaac, can’t wait for your ebook to come out. Won’t the coconut oil be too strong for the steam pork? Felicia, use normal cooking oil, I used coconut oil in this recipe because of my wife’s hypothyroid problems. Coconut oil do not become transfat after cooking. Wife can’t take transfat too much since she is on thyroid medication and other supplements. After working with her for nearly more than a year on clean food, her autoimmune system are much better but still a long way to go to fix all that. Take a long time with clean food.